Berkey® systems are capable of purifying both treated water and untreated raw water from such sources as remote lakes, streams, stagnant ponds and water supplies in foreign countries, where regulations may be substandard at best. The Sport Berkey® features an Ionic Adsorption Micro Filtration System. Katadyn™ has an EPA-registered Purifier Water Bottle that provides safety and convenience for many user groups including militaries, health organizations, and outdoor adventurers worldwide. The 3-phase water filter eliminates bacteria, protozoa, viruses and improves taste. 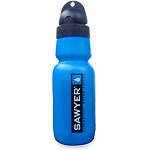 Sawyer™ offers polycarbonate flip-top water bottles with an advanced fast-flow inline filter so you can do more yet pack less. The Filtering Bottle and the Purifying Bottle both exceed EPA standards to remove 99.9999% of all bacteria and cysts like giardia and cryptosporidium for 2,000 fill-ups. SteriPEN™ is the only portable water purifier that uses ultraviolet (UV) light to destroy waterborne microbes. Whether your source is a woodland brook or an overseas hotel tap, SteriPEN purifies clear water by destroying viruses, bacteria and protozoa—including Giardia and Cryptosporidium—in seconds. Sawyer’s Biological Filtration system removes 7 log (99.99999%) of all bacteria like salmonella, cholera, and E. coli. And 6 log (99.9999%) of all Protozoa such as Giardia and Cryptosporidium. You will find these removal rates to equal or exceed competitive options. EPA guidelines allow ten times more Protozoa left in the water than Sawyer® allows. The convenient drinking bottle with a water filter. The Katadyn Bottle is a practical drinking bottle with an integrated water filter. Prepare clean drinking water anytime and everywhere: Just fill the bottle and drink – without pumping. Perfect for smaller amounts (e.g. for hiking, travelling or sports). The 3-phase water filter eliminates bacteria, protozoa, viruses and improves taste. Weight: 8 oz., dimensions: 3.5 x 3.5 x 12 inches, 1 Liter.